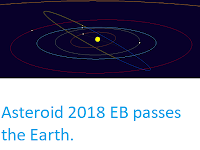 Sciency Thoughts: Asteroid 2018 GU1 passes the Earth. 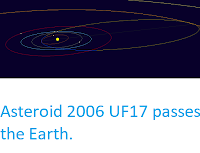 Asteroid 2018 GU1 passed by the Earth at a distance of about 653 600 km (1.70 times the average distance between the Earth and the Moon, or 0.43% of the distance between the Earth and the Sun), at about 7.20 am GMT on Sunday 8 April 2018. There was no danger of the asteroid hitting us, though were it to do so it would not have presented a significant threat. 2018 GU1 has an estimated equivalent diameter of 26-82 m (i.e. it is estimated that a spherical object with the same volume would be 26-82 m in diameter), and an object of this size would be expected to explode in an airburst (an explosion caused by superheating from friction with the Earth's atmosphere, which is greater than that caused by simply falling, due to the orbital momentum of the asteroid) in the atmosphere between 20 and 1 km above the ground, with only fragmentary material reaching the Earth's surface, though since an object at the upper end of this range would explode with an energy with an energy equivalent to about 20 megatons of TNT (i.e. an explosion slightly larger than the Hiroshima bomb), being directly underneath it might be rather unpleasant. The calculated orbit of 2018 GU1. Minor Planet Center. 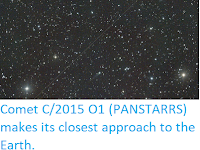 2018 GU1 was discovered on 10 April 2018 (four days after its closest approach to the Earth) by the University of Arizona's Catalina Sky Survey, which is located in the Catalina Mountains north of Tucson. 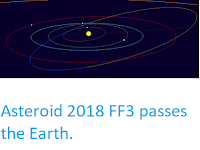 The designation 2018 GU1 implies that it was the 45th asteroid (asteroid U1) discovered in the first half of April 2018 (period 2018 G). 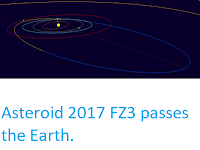 2018 GU1 has a 711 day orbital period and an eccentric orbit tilted at an angle of 23.0° to the plane of the Solar System, which takes it from 0.90 AU from the Sun (i.e. 90% of he average distance at which the Earth orbits the Sun) to 2.21 AU from the Sun (i.e. 221% of the average distance at which the Earth orbits the Sun, and more distant from the Sun than the planet Mars). It is therefore classed as an Apollo Group Asteroid (an asteroid that is on average further from the Sun than the Earth, but which does get closer). 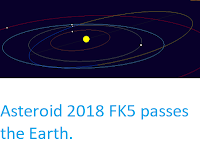 This means that close encounters between the asteroid and Earth are extremely common, with the last having occurred in April 2016 and the next predicted in December 2019.